I know what you’re thinking – “prevent PMS? There’s no way to do that!” We grow into womanhood believing that PMS is an inevitable part of being female. Then so many of us experience it, we believe that must be true. We just accept that once a month for a few days, a week, longer maybe, we feel crabby, angry, low, anxious, lacking in confidence, frustrated, as well as bloated, ravenously hungry, craving sugar, and covered in acne! Pah! How is that okay? Well, actually, it’s not okay. No woman should suffer with PMS. No woman has to suffer with PMS. If I have one message I want to communicate full blast – it’s this: PMS is not normal. You can prevent PMS completely naturally. PMS is a symptom of a hormonal imbalance and that imbalance can be fixed. Usually this imbalance is a case of too much estrogen, or estrogen dominance, coupled with low progesterone levels. You can combat your PMS with the right morning routine, by getting good sleep, by increasing the pleasure in your life, and by changing your diet to support your hormonal shifts and help your body to create, process and eliminate hormones in the way that’s best and most healthy for you. I make choices about what I eat based on where I am in my cycle. I have managed to get to a point that is long passed PMS by doing this. The FLO Living protocol didn’t just heal my PCOS, help me to lose weight, and banish my acne, it also got rid of my PMS for me. I’m not kidding, in fact when my husband goes out for a guy’s night with his friends, they will sometimes end up talking about their relationships, their girlfriends and wives, and often his friends will share that their partners suffer with PMS and during “that time of the month” they get into fights and feel like they have to stay out of the way. My husband loves being able to say that his wife doesn’t experience PMS. These men, they cannot believe that is possible – but it is. Chickpeas – these are a great source of B6 which helps with progesterone production. If your progesterone levels are low in the second half of your cycle you will experience both stress and period issues. A low level of B6 can make estrogen dominance more pronounced, when you have too much estrogen in your blood stream and not enough progesterone. Kale and leafy greens – all of the brassica family greens, but especially kale, contain indole-3 carbinol, which is a powerful hormone balancer. This compound promotes estrogen metabolism, which allows us to eliminate excess estrogen and prevent estrogen dominance. Coconut yogurt – my favorite kind of coconut yogurt is Anita’s Creamline Coconut Yogurt, it is utterly delicious. This yogurt contains probiotics in the form of live cultures and lots of good fats, which are both mood stabilizing and prevent PMS food cravings. 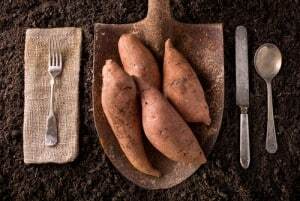 Sweet potatoes – not only should they satisfy your sweet cravings – consider drizzling roasted sweet potatoes with some honey and top with pecans – but because they are rich in vitamin A, they will also help your liver break down excess estrogen, balance out your blood sugar levels, and balance your mood. Bone broth – a fantastic source of the electrolytes magnesium and calcium which will prevent the headaches, migraines and fuzzy headedness that can come with PMS. Have a cup before bed to also benefit from its sleep enhancing properties! Second, which PMS symptoms do you get each month? Thanks Alisa for these tips. I do appreciate your advice. I suffer with PMS; mainly with being crabby and emotional for about a week before my period. (I can happily say though that I don’t suffer any of the other ‘physical’ symptoms). Its no fun and seems to get worse as i age (im 40) Is it the change in hormones that causes it? I eat a healthy organic diet, have changed to all organic and natural cosmetics and household products, take probiotics, multi vit/min, maca and transdermal magnesium. I sleep quite well too. Do you think a progesterone cream would help me? There is no vegetarian replacement for collagen or certain amino acids, but you can make a mineral rich broth, for sure. Combine veggie scraps like seaweeds, mushrooms, potato skins, carrots, etc! Question; do you have another option for Bone broth as vegetarian? In your article you state coconut yogurt. Will plain whole milk organic yogurt be an acceptable substitute? Organic yogurt, grass fed yogurt still contain estrogen and hormone destabilizing properties. I would cut all dairy if you are struggling with PMS symptoms! There are so many benefits to eating kale and other cruciferous vegetables. But there are conflicting ideas about whether or not people with thyroid problems should be eating them. Some say the nutritional pros outweigh any thyroid inhibiting cons. Some say cooking or fermenting cruciferous vegetables render them fine for thyroid issues. What are your thoughts? Thank you for doing what you do! If you are struggling with hypothyroidism cutting down on the goitrogenic veggies can be helpful. You can still keep them in you diet as long as they are cooked, but limit to 2 – 3 times per week. Ugh. Sweet potatoes are the solution to everything, I swear! This article is getting pinned for sure! During What phase of the cycle do you recommend these foods? Thanks!